Pattern is available in English. Difficulty: Medium to advanced. Every row is charted and there is no written row-by-row included. This is a slip stitch pattern, so you will only work with one colour yarn at a time. You need knowledge of doing a crochet provisional CO, or equivalent. 3 skeins (300g) of hand dyed Merino Sport Weight from Ripples Crafts Hand Dyed yarns. One skein contrasting colour (CC) and two skeins main colour (MC). (286 yards/262 m per 100g skein). Shown in the colours Red, Red Wine (MC) and Autumn Fruits (CC). The vest can also be worked in a single colour. Mix your own colours or buy yarn kits at www.ripplescrafts.com. As with all fitted knitting, the right yarn is important for the end result. Needles: Long circular needles size US 4 and 2 ½ (3.5 mm and 3 mm) for size S/M. US 6 and 4 (4 mm and 3.5 mm) for size L/XL or needles to get gauge. Spare needles of same or smaller size. The individual pieces can be worked on straight needles if you prefer, but you need circulars for the edges. If you work this in a single colour and size S/M, you might be able to do it with only two skeins, as I used only 198 g for the prototype, but please do not hang me if it doesn’t work out! All is depending on getting the correct gauge. Sizes: European sizes S/M, (L/XL). 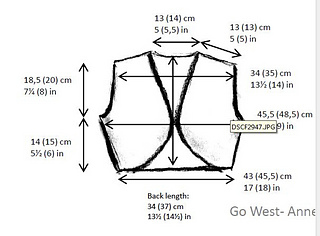 Size is determined by needle size, the pattern charts are the same for both sizes. Please refer to drawing for measurements. If you wish your vest to be larger than the largest size, feel free to experiment with even larger needles. You should have enough yarn to do an XL/XXL size without problems. Please refer to drawing for measurements. 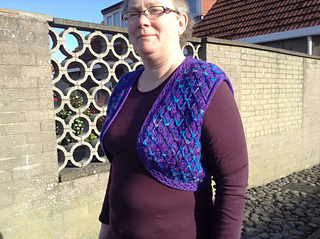 The vest overlaps a fraction in the front, so you could add a closure if you choose. Gauge: 21 (19) sts and 30 (29) rows to 4” (10cm) in st st on larger needles, relaxed after blocking. Make sure you get gauge as this determines the size of your finished work. Gauge for pattern stitch is 30 (27) sts and 38 (36) rows to 4’’ (10 cm) on larger needles. Swatching is strongly recommended! Other useful items: You will need a number of removable stitch holders (pieces of scrap yarn will do) and some scrap yarn for the provisional CO.
Construction: All three parts of the vest are worked separately, then shoulders are joined with a 3-needle BO. Sides are sewn together, and sts picked up to work the rolling edges around armholes and the quilted cross-stitch ribbing around neck, fronts and back. The only sewing necessary is the side seams.